Successfully Added 16GB High Security USB Flash Drive (AES 256 Encoding, Unlimited Partition Creation) to your Shopping Cart. 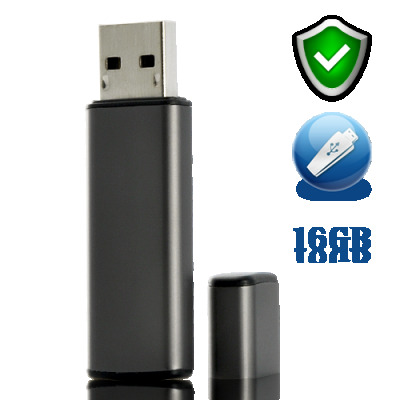 16GB High Security USB Flash Drive (AES 256 Encoding, Unlimited Partition Creation) - keep your data safe and secure. Wikileaks, Lulzsec, Anonymous? Bring it on. USB flash drives can hold any type of data. Often valuable, personal or confidential data is stored and carried around for easy access. However, security is always an issue - until now. Never before has so much technology been poured into a data storage device for you to store documents, digital files, games, and anything else you want to carry around safely and securely. By encrypting data, it will be inaccessible without an encryption password. Most importantly, this high security USB flash drive comes with built-in hardware based 256-bit AES encryption to protect your sensitive data. Now, you can carry your work or personal files wherever you go secure in the knowledge that your data is safe. Your work presentation, your family photos, even your Outlook contacts are safely and securely tucked away from prying eyes on this high security USB flash drive. Even better, this is an encryption drive with the partition creation feature which not only protects using encryption but hides them on any memory source. This feature that makes the differentiate from normal flash drives. Photos, music and videos files are easily transferred to USB storage devices. More and more public and retail outlets accept data transfer through USB drives for convenient and smooth data transfer, for instance in libraries or in photo shops. This 16 GB flash drive- is now priced better than ever to give you the most value for your money. A great product for anyone looking for something unique for themselves or to give as a gift. Available in our warehouse right now, hurry and order yours while supplies last!